Sleek design makes it easy to carry. Today iPhoneSwiper (http://www.iphoneswiper.com), along with partner Impact PaySystem, announced it is offering its state of the art wireless credit card processing terminal for free with a merchant account from Impact PaySystem. 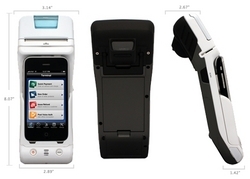 iPhoneSwiper is the only credit card terminal that has an integrated credit card magnetic-stripe reader, Infra-red barcode scanner, and thermal printer. The terminal, coupled with the gateway software through iPhoneSwiper powered by Impact PaySystem, allows merchants to easily view and control all their store's products through the iPhoneSwiper software. This transforms the software from your simple, low-end "credit card processing only" software, to a full point-of-sale system which uses the UPC barcode scanner to quickly create an order and accept payment for it. At the same time, the software will automatically update the database and inventory while orders are being placed. This enables merchants to view which items sell well, which sold out, and which do not sell at all. For more information on iPhone Swiper and Impact PaySystem, visit http://www.iphoneswiper.com and/or http://www.ImpactPaySystem.com or call 877.251.0778.